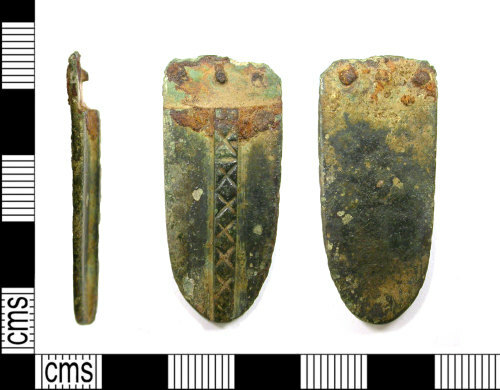 Early medieval copper alloy strap end, 39mm long, 17mm wide and 2mm thick with a weight of 8.40g. The object is sub rectangular in form and rectangular in cross section, it is a 'tongue' shaped type which is plain except for a rectangular cross sectioned vertical ridge running down its centre, which is decorated with incised 'saltaire' crosses. It has a recessed rectangular upper front edge which houses three iron rivets, arranged in a horizontal row. Around this area both surfaces have iron staining and towards the rounded base on the front there is a patch of silvering on the left side. The form is a simplified Thomas class E type 3.